The ethanol that goes into our gas tanks could fuel far more than transportation. It can also be transformed into valuable alcohols used in paints, solvents, adhesive and other everyday items. The challenge lies in the conversion process, which can be inefficient. Scientists have long known how to turn ethanol into these so-called higher alcohols using the Guerbet reaction, which was discovered more than a century ago. Aided by heat and a catalyst, the reaction couples ethanol molecules to produce desirable manufacturing chemicals such as 1-butanol and 2-ethylhexanol, which are currently derived from fossil resources. But the process also tends to touch off side reactions that result in excessive byproducts, lowering its efficacy. Researchers at PNNL have developed a stable catalyst that—for the first time—can efficiently convert ethanol to higher alcohols, more than doubling the yield of the most effective catalysts reported so far. "Usually when you do this kind of catalytic conversion, the biggest problem is getting the selectivity to the product that you want," says Karthikeyan K. Ramasamy, a research engineer within PNNL's Chemical and Biological Processing Group. Using a catalyst made of atomically dispersed copper on magnesium and aluminum, the researchers were able to convert more than 60 percent of the ethanol processed in a single pass. More than 80 percent of the reaction products are desired higher alcohols. The ethanol goes through a chemical cascade before it ultimately becomes a higher alcohol like 1-butanol. "This catalyst has three different materials in it," Ramasamy says. "Each material helps in different steps of the chemical cascade. In the end, all of them work together and help this complex chemistry to happen efficiently." What helped make the catalyst so effective, Ramasamy says, is that its copper atoms are highly dispersed—if the atoms are clumped together, rather than working individually, the catalyst won't be as effective and will produce unwanted byproducts. 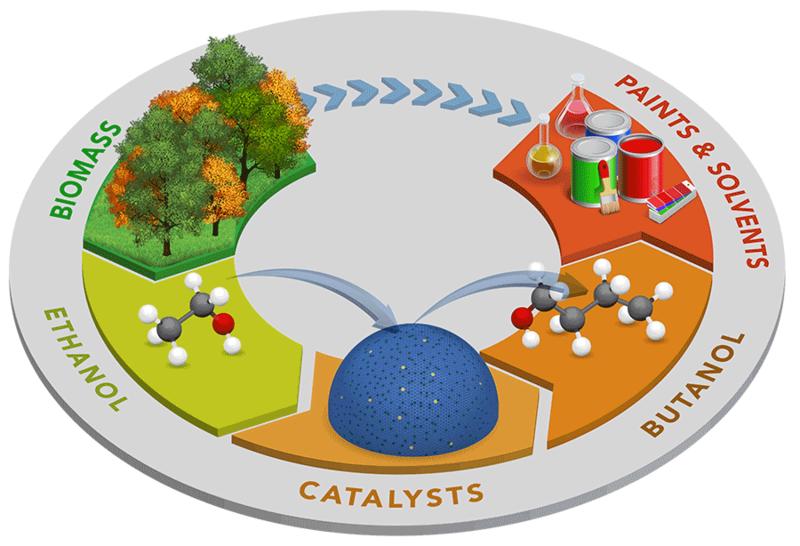 The newly developed catalyst was robust enough to perform consistently for more than 500 hours. The expanding ethanol industry has diversified to include feedstocks beyond corn, including municipal waste and other biomass, yet it remains heavily dependent on the transportation market, where it is blended into gasoline for cars, but in limited amounts. 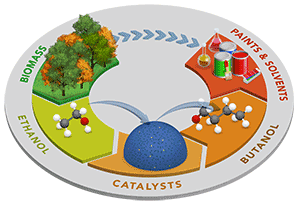 This research is the next step toward a renewable biorefinery similar to today's petroleum refineries, where ethanol is not just a fuel, but a building block for more valuable chemical products.